PHOENIX — A frog species in Arizona and southern Nevada does not need federal protection under the Endangered Species Act, thanks to the multi-partner conservation efforts of the Arizona Game and Fish Department, U.S. Fish and Wildlife Service, and other federal and state agencies that make up the Relict Leopard Frog Conservation Team. 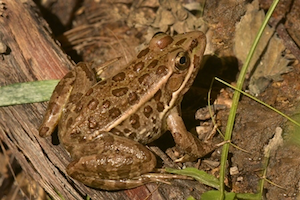 The Fish and Wildlife Service has determined that relict leopard frog populations are stable or increasing. One year after the announcement by the Department of Interior that a listing under the Endangered Species Act was not warranted for the greater sage grouse and the implementation of restrictive resource management plans for the species, the Public Lands Council and National Cattlemen’s Beef Association submitted a report to the agencies citing concerns with the methodology used. SACRAMENTO - The California Energy Commission and the Department of the Navy signed a Memorandum of Understanding (MOU) today that will help the state and the Navy and Marine Corps continue to operate on the cutting edge of technology by pursuing innovative renewable energy initiatives. Energy Commission Chair Robert B. Weisenmiller and Assistant Secretary of the Navy for Energy, Installations and Environment Dennis V. McGinn signed the agreement formalizing a partnership that supports Navy and Marine Corps installation efforts to develop alternative energy resources and increase energy security and reliability. The MOU ensures continued collaboration and information sharing on energy projects and initiatives.